Italian is a very easy language to learn. In fact, it is very easy to read as we pronounce it as it is written. In addition, no stress is involved in reading as you should read slowly and take your time when you pronounce the vowels; they should be over pronounced in comparison with English pronunciation. In fact, I always say to my students that the longer the vowels and, therefore, the more stretched the syllables, the more they sound like they are from the South of Italy! This is a very good thing. Moreover, many words are very similar between Italian and English. As you may already know, Italian is a Latin language and, therefore, all English words coming from Latin have a corresponding Italian word, easily recognizable. For example, volcano (vulcano), city (citta’) or family (famiglia), defenestrare (defenestration, to throw someone out the window) and so on. Having said this, you should not worry. In the first instance, grammar can be learnt in easy ways, and, most importantly, it should always be linked to immediate and practical usage. In my classes I have seen many students improve, not only their conversation skills, but also their grasp of grammar. One of them really impressed me. He hated grammar, and probably he still hates it, but through role playing of real life situations we approached grammar in an indirect way, and, almost incidentally, came to understand all the grammar we worked on during the winter. Now he is doing very well and learning away! Are you reading? Did you recognize yourself? If I can give a piece of advice, I would recommend never letting grammar stack up. As soon as you have time, you should go over your lessons and do your exercises and take a look at them before the next class. If you don’t understand, you should ask your teacher immediately for further or different explanations. This is your second or third language, therefore there is nothing to be ashamed about. If you have been studying Italian for a while, it would be great to know what you think about this subject and if have any suggestions for those who are just starting to learn Italian! Capodanno in Italia? Fantastico, ma attenzione alle tradizioni! Let’s start with a couple of words about Capodanno which means the first day of the year. In Italy Capodanno includes New year’s eve and the first of January. Capodanno is composed of two words and a preposition CAPO D’ANNO which literally means HEAD OF YEAR. As in all the countries we have some traditions which are supposed to bring good luck. For example, all over in Italy we use to eat ‘Lo zampone e le lenticchie’. Lo zampone is the trotter of the pork with a roll of skin attached and filled with lean pork meat (see picture). Le lenticchie are lentils. Sometimes, people don’t like to have a foot of pork in their plate, so they go for ‘Cotechino’ instead. It looks like a big sausage (see picture) and it is the some thing as zampone. This plate eaten during the night is supposed to bring money and prosperity to the eater. Try next year and let me know! Another food which is suppose to have the same property is the ‘Melograno’ or pomegranate. Lentils and pomegranate seeds are actually quite similar. An old tradition says that you should kiss someone underneath the mistletoe… I have never seen anybody doing it, I am not so old! During Capodanno’s night we are also used to having fireworks, and any town, small or big, has their own. Many families also buy their own to have their own fun. In the antiquity, fireworks were supposed to keep away evil spirits. In the end, please, take a piece of advice. If at Capodanno you are around Napoli, be extremely careful. As another of our traditions is to throw away things during Capodanno’s night! Over there, they throw things out of balconies and windows… you really don’t want a washing machine or dishwasher landing on you… Also because in Italy we say that you will spend the rest of the year in the same way you spend Capodanno and you really do not want to spend it in a hospital! If you want to impress your friends with your Christmas greetings in Italian, you should say BUON NATALE E FELICE ANNO NUOVO which means marry Christmas and happy new year! You can also have a slice of Panettone (sweet bread loaf with raisins and candied fruit original from Milan) or Pandoro (without raisins and candied fruit, original from Verona) with a glass of Spumante wine which is sparkling, white and quite sweet… But you you should not forget to tell your friend about the Befana! In fact, in Italy we also celebrate the Befana the night between the 5th and the 6th of January, the Epiphany. She is an old and ugly woman, with a hooked nose and a pointed chin and she is always pictured riding her broom among stars in the night. As she goes down the chimneys to bring sweets to children, she is also covered with soot. Legend says that she gave some food and pointed the right direction to the three wise men during their long journey. They invited her to come along to meet baby Jesus, but, as she had a lot of housework to do, she refused. When they left, she realised that it was very important to offer her greetings to baby Jesus. Therefore, she left her house and she started her journey on her broom, but she got lost! Since then, she is been looking for baby Jesus and going down all the chimneys to leave sweets in the socks which children have left for her hooked on the mantelpieces of their fireplaces. She still hopes that one of them will be baby Jesus! In many years of teaching Italian to non native Italian speakers I have accumulated a great deal of understanding about my students’ learning process. 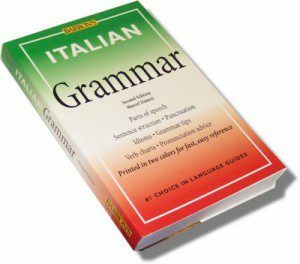 In fact, there are some mistakes which are common among native English speakers, others to Spanish and so on, and they are due to the intrinsic nature of their own language which is the starting point on which they build their knowledge of Italian. I am preparing a section on this website dedicated to overcoming these stumbling blocks, as it is better to get rid of them sooner rather than later. There are also many little ‘Memory tricks’ which are very helpful in order to remember verbs and grammar rules and I am delighted to share them with as many learners as possible. The majority of these tips come during my lessons, therefore I will update my blog frequently with new suggestions and tips for those who attend my classes, but anyone can benefit from them. 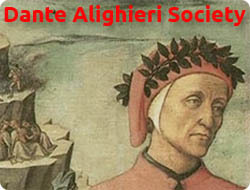 You might find it interesting to know that during my Classes, depending on our topics, we explore many Italian expressions, sayings, proverbs and other Italian ‘Chicche’ or ‘Gems’. Those are intrinsic to an Italian native’s cultural background, but they can be explained and, of course, learned. I would love to share them with those who are interested; you will find answers to many questions and discover so much about our language’s background. In fact, our expressions come from the most incredible and disparate sources and they are part of our daily conversations. For example: we say that ‘Una situazione e’ fantozziana’ when a situation is incredibly ridiculous. The adjective ‘Fantozziano’ comes from a series of comical movies which were very popular among Italians in the 80s. The movies are neither masterpieces nor particularly educational, but everyone in Italy knows what ‘Fantozziano’ means. Other words, such as ‘Lazzaretto’ have a more elevated cultural origin. In fact, the Lazzaretto was the name of the place which, between 1403 and 1630, housed a hospital which cared for people during the plague epidemics as a leprosarium. This is mentioned frequently in the ‘Promessi Sposi’, the first Italian novel written by Alessandro Manzoni in 1827. Therefore, as it is read and studied in many Italian secondary schools, we use the word ‘Lazzaretto’ when we talk about a house were everybody is a bit sick, for example: ‘Io ho il raffreddore, mia mamma ha il mal di gola, mio padre ha la tosse… insomma casa mia e’ un lazzaretto!’–> ‘I have got a cold, my mother has got a sore throat, my father is coughing, in short, my house is a lazzaretto!’. My students are always happy to come to know these little interesting stories about my language and it is even more fun when I show a piece of the movie which ‘enriched’ our language! I came to terms with the fact that when I say to anyone in Ireland: ‘I am from Turin’, they answer: ‘ah, Fiat’ and sometimes they also say: ‘Juventus!’. Thankfully, this is not what Turin is about and those who went there can confirm it. 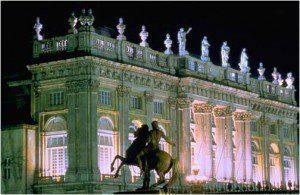 In fact, although Turin is a big and industrial city, it is beautiful and has many historical and artistic treasures to offer to its visitors. 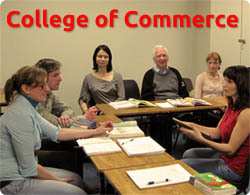 Thus, in order to give a chance to shed a bit of light on these treasures, I have started to show a short presentation on my home town during my 2,5 hour lessons at the College of Commerce. I am delighted to see that all of my students are suitably impressed by the view of majestic royal castles, neoclassic and baroque churches, beautiful gardens, Roman city walls, enchanting old cafes and so on. One of my students could not believe that it was possible to have a coffee and read a book in one of those bars, such as Caffe Torino or Gelateria Fiorio. Do not worry about the price of the coffee, it is the same as other bars, we are not in Piazza Marconi in Venice! 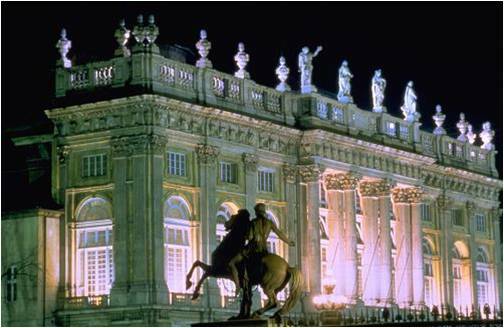 Not many people know that Turin was the first capital of Italy and that the royal family lived there until 1946, when Italy became a republic. This is why we have so many beautiful royal residences and castles. Turin also hosted the first Italian parliament in Palazzo Carignano, a beautiful baroque residence which nowadays hosts the library of the University of Turin, the museum of Risorgimento and Carignano Theatre. There are many differences between the North and South of Italy which are not only about environment and climate, but also about the people and the way they think and behave. This is due to historical and geographical reasons which are very interesting and unique in their own way. There are many interesting books and movies on this subject and I recommend the book ‘Cristo si e’ fermato ad Eboli’ written by Carlo Levi in 1945. It gives a good insight into the situation in the South of Italy during Fascism and it sheds some light on why life is so different from the North. The movie, made in 1970, highlights these features effectively and it is definitely easier to digest. In fact, it must be said that the book is quite demanding, not only for an Italian student, but also for an Italian native speaker. 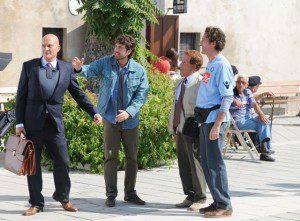 On the same subject, during our classes, we recently watched parts of the comedy ‘Benvenuti al sud’. Although, it is not as insightful and rich in meanings as ‘Cristo si e’ fermato ad Eboli’, it is a funny guideline on all the prejudices held by many people in the North about the South. Probably, you are aware of the existence of the political party Lega Nord inItalyand, through this movie, you will see some of the ideas on which it is founded. Besides, the movie offers a great view on many features which are so different between the North and South, such as foods, habits, environments, accents and even on the use of the Italian language (did you know that in many parts of the South they use the Voi instead of Lei in order to be formal, exactly as the French do!). It is very funny and enjoyable and not too demanding, especially if you have subtitles. That is everything for today; I hope you will enjoy the movies and maybe the book.